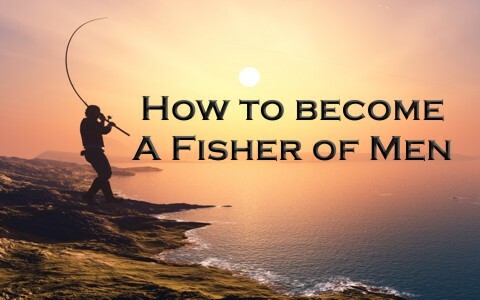 How can we become “fishers of men?” The Bible tells us how. Until a person is convicted of their sin, they will never see their need for the Savior. The law does one thing above all; it shows that we’re all guilty and worthy of God’s wrath. That’s because the law shows us what sin is and that sin is the transgression of the law of God (1st John 3:4). Even though we are not under the law today, it doesn’t mean we shouldn’t strive to live in obedience to the law. The law is not the problem…it is the lawbreakers like you and I that are the problem. The Apostle Paul asks, “What then shall we say? That the law is sin? By no means! Yet if it had not been for the law, I would not have known sin. For I would not have known what it is to covet if the law had not said, “You shall not covet” (Rom 7:7). Paul wrote, “I was once alive apart from the law, but when the commandment came, sin came alive and I died” so “The very commandment that promised life proved to be death to me” (Rom 7:8-9). Paul wrote that sin was “producing death in me through what is good, in order that sin might be shown to be sin, and through the commandment might become sinful beyond measure” (Rom 7:13). I am absolutely not saying that the law isn’t good because if not for the law, we wouldn’t even know what sin was, but this same law, thankfully, shows us what sin is. People have no real excuse to not believe in God. The Bible says that we are all without excuse (Rom 1:20) because we simply suppress the obvious existence of God (Rom 1:18). Even “The heavens declare the glory of God, and the sky above proclaims his handiwork” (Psalm 19:1), and “Day to day pours out speech, and night to night reveals knowledge” (Psalm 19:2), so even the creation declares God as Creator and proclaim “his handiwork.” How else did everything come into existence, so in a similar way, “we know that whatever the law says it speaks to those who are under the law, so that every mouth may be stopped, and the whole world may be held accountable to God” (Rom 3:19). In other words, those who reject Christ have no excuse at all and as such, they stand guilty before God. Unless they are convicted by the law that they are sinners, they will never see the need for God’s grace. It is God’s wrath that makes God’s mercy relevant. Don’t think that people have an excuse to not believe in God. The Bible teaches otherwise, so how do we use the knowledge of sin to stop the mouth of those who think they’re a good person? Reveal to them that Scripture says, “None is righteous, no, not one” (Rom 3:10), and “All have turned aside; together they have become worthless; no one does good, not even one” (Rom 3:12), so those who think they’re a “good person” should be reminded, as Jesus said, “No one is good except God alone” (Mark 10:18b). How do we become or learn to become fishers of men and women? We must take Jesus’ imperative command seriously. Jesus gave the church her marching orders and there is no plan B. We must “go into all the world “and make disciples of all nations, baptizing them in the name of the Father and of the Son and of the Holy Spirit” (Matt 28:19) and be “teaching them to observe all that I have commanded you” (Matt 29:20a). So how do we become fishers of men and women? We “go!” We must use words…because they are necessary. We can live a life that shows Christ in our life but is that enough? Not according to the Apostle Paul who asks, “How then will they call on him in whom they have not believed? And how are they to believe in him of whom they have never heard? And how are they to hear without someone preaching” (Rom 10:14), “And how are they to preach unless they are sent? As it is written, “How beautiful are the feet of those who preach the good news” (Rom 10:15)? Unless people hear the gospel, they won’t be saved because “faith comes from hearing, and hearing through the word of Christ” (Rom 10:17). It’s not our life that leads people to Christ, it is the words we use to point them to Christ, and there is real, potent power in our words when we quote Scripture. If we are ashamed of Christ and mentioning the gospel, Jesus might deny us before the Father and all His holy angels as Jesus said, “whoever denies me before men, I also will deny before my Father who is in heaven” (Matt 10:33). I have no power to save anyone, so I must depend on God’s Spirit to help me know what to say to the lost, but God’s Word has miracle-working power. God says about His Word, “so shall my word be that goes out from my mouth; it shall not return to me empty, but it shall accomplish that which I purpose, and shall succeed in the thing for which I sent it” (Isaiah 55:11). God’s Word will do what He sends it out to do, but He may use us as His voice to speak these words to accomplish what God desires to have accomplished. Are we ashamed of the gospel by our sin of silence? How often I have sinned this, but only later came to understand that the gospel itself has power. Paul writes, “For I am not ashamed of the gospel, for it is the power of God for salvation to everyone who believes, to the Jew first and also to the Greek” (Rom 1:16), but we also know that “the word of the cross is folly to those who are perishing, but to us who are being saved it is the power of God” (1st Cor 1:18). The gospel has its own power source because it is the very power of God to cut us to the bone and discern our thoughts and intents (Heb 4:12-13), but we must understand that some will reject our message because “we are the aroma of Christ to God among those who are being saved and among those who are perishing, to one a fragrance from death to death, to the other a fragrance from life to life. Who is sufficient for these things” (2nd Cor 2:15-16)? If we fail to present the law to sinners, then we’ve left out the very definition of what sin is (1st John 3:4) and why they need to be brought to repentance. It “stops the mouth” or takes away their excuse because they know that God exists so they have no excuse. If we simply unleash the power that’s found in God’s Word, we get God’ involved, but most will reject the good news and so it shouldn’t surprise us that many will be offended. That’s okay. It’s to be expected. I cannot save anyone. I couldn’t even save myself. Salvation is fully a work of God and not of man (Eph 2:8-9) so all we can do is remember that it takes a woman or man of God with the Spirit of God using the Word of God to make children of God, all for the glory of God. In other words, it’s not our responsibility to save anyone; it is their response to his ability, even though it is all of our responsibility to tell them. Good answers in this article: What is the Gospel Message? Previous post: Why Didn’t Jesus Get Married While On Earth? Next post: Can You Frustrate God’s Grace?